Learn and practise the neccesary skills to move confortly in winter mountains with autonomy and safety. Develop confidence to walk all year round.Winter Mountaineering Courses in Madrid, Pyreenes, Picos de Europa, Sierra Nevada! 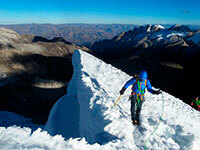 Venture with us in the winter mountaineering world. 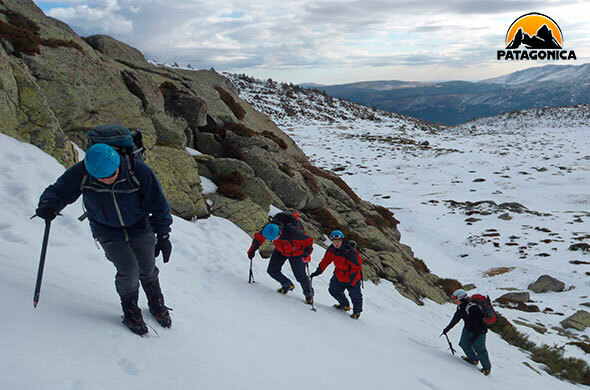 This course will introduce you to the technical skills to tackle winter ‘scrambling’ type terrain, the correct handling of crampons and ice axe, self-arrest maneuvers and the risks of ice and snow in the mountains. 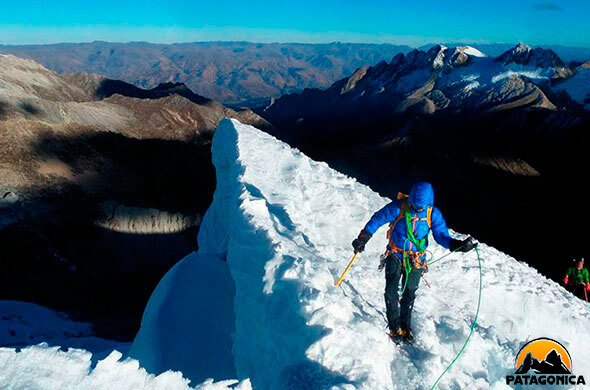 Specific gear for Winter mountaineering. Ice axe self-arrest in different snow slopes. Movement skills using ice axe and crampons in ascent and descent. Security techniques. A.R.V.A (Transceiver), shovel and probe. All weekends from December to May. From Mon to Fri: 10% discount. Sierra de Guadarrama - Madrid. Sierra Nevada - Granada (ask us). Aragón - Pyreenes (ask us). Clothing suitable for winter mountaineering (Consult us). Hiking boots, ideally rigid or semi-rigid. Winter gloves and hat. Sunglasses or Ski goggles. Water (minimum 1,5 l) snack food (nuts, energy bars). Ice axe and crampons if you have. 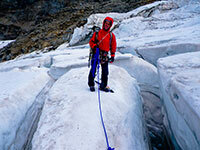 Personal gear: Ice axe, crampons, Helmet, harness. 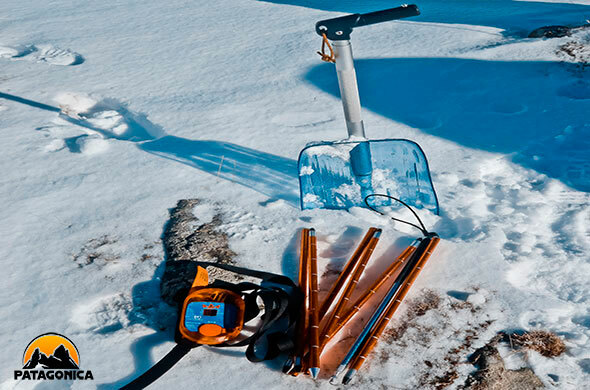 Group equipment: First aid kit, maps, compass, avalanche transceiver, shovel and probe. Not included: Meals, drinks, transportation (consult us). Small groups - ratio 1:6. Bigger groups phone for details or contact us. This course will develop the skills required to tackle winter ‘scrambling’ type terrain and to extend the techniques learned in the first level, technical fields and ascent with more commitment. 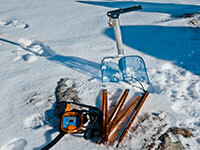 Introducing the rope and security elements in snow, like stakes, ice and snow anchors or ice screws. Técnicas avanzadas de piolet y crampones. Piolet tracción y puntas frontales. Aseguramientos en nieve y hielo. Piolet- bota, piolet- cadera, piolet enterrado. Anclajes y reuniones en terreno nevado. Progresión encordados en ensamble y a largos. Small groups - ratio 1:4. How to get the fullest advantage of your global positioning system to enjoy a quiet and safe day in the mountain, to know how to get out of a thick fog or the latest trends in geocaching are some of the course contents. 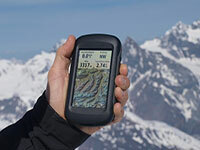 Advantages and limitations of GPS units. Setting up, how to change the settings of your GPS. Creating waypoints and making a route. Making a track of where I am walking. What is geocaching and how do I do it?. Small groups - ratio 1:8. Learn the necessary to progress on glacial terrain and perform the rescue techniques of victims falling into cracks. 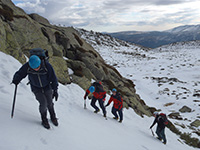 Course especially designed for people doing their first trips to massifs like Alps or Andes, where crossing glaciers is always necessary before the Ascension. Glacier Morphology and snow behavior. Glacier Tie-in, roped team of two or more. Ascending the rope in self-rescue. Crossing a bergschrund or crack on a snow slope. How to design a Glacier route. Basic and essential device for the XXI century mountaineer. Stay one step ahead avalanches and acquire the knowledge required for proper use of avalanche transceiver, shovel and probe. Course designed especially for backcountry skiers, snowboarders, and mountaineers. How to avoid snow avalanches. Specific avalanche rescue equipment.Transceiver, shovel and probe. Snow testing to know the snowpack. 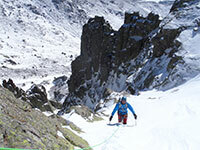 Performance and progression in susceptible avalanche terrain. Using the transceiver, shovel and probe in avalanche victims search. Coordination, search and rescue of avalanche victims. We are happy to create it for you. You can hire one of our instructors or guides, including any equipment. If you’re a group, all of our courses are available on a date that suits you or if you would prefer we can tailor a course to your requirements. Simply give us a call to discuss your requirements.